By Scott Gilfoid: Amir Khan (31-3, 19 KOs) feels he’s the one who can slide into the No.1 spot as the top fighter in boxing after Floyd Mayweather Jr. walks away from the game after his September 12th fight against Andre Berto. Khan would have liked to have proven himself as the top fighter by facing Mayweather and beating him, but Mayweather had chosen to pass him up for a fight against Berto, a fighter better known in the United States than Khan with the casual boxing fans. Khan says he wants to fight Manny Pacquiao and he’s hoping that fight can be made in 2016. Whether it does or not will be up to Pacquiao’s promoter Bob Arum of Top Rank, and of course to Pacquiao if he has any say so in who he’s matched up against. I don’t know that Khan will automatically become the No.1 fighter in boxing if all he does is defeat an aging 37-year-old Pacquiao with him coming off of shoulder surgery to repair a torn right rotator cuff. I mean, it’s not as if Pacquiao is the same fighter he once was, and we are talking about a fighter that is both old and coming off of a career-threatening injury to his shoulder. If Khan were to beat Pacquiao at this stage, you would have to dismiss the victory and attribute it to Pacquiao’s debilitating injury and his advanced age. If Khan is going to take over the No.1 spot as the best boxer in the sport, then he’s going to need to beat some young lions with all their teeth and claws still intact. It doesn’t count if the lion Khan defeats an old scared up lion. Even if Khan beats Pacquiao, which I don’t see happening in this lifetime, Khan would still need to defeat Shawn Porter, Keith Thurman, Gennady Golovkin, Saul “Canelo” Alvarez, Miguel Cotto, Kell Brook, Marcos Maidana, Danny Garcia, Errol Spence Jr., and Tim Bradley before he could have bragging rights as the No.1 fighter in boxing. I had to throw in Canelo, Cotto and Golovkin because those are guys that Khan should have to face because Mayweather defeated two of them to become the No.1 fighter in the sport. So what we’re really looking at is Khan being roughly 11 fights away from being able to make the claim that he’s the best fighter in the sport. I mean, if Khan can win those 10 fights and take all their scalps, and then for sure he would have to be seen as the No.1 guy simply because he’d beaten all the best in the sport. However, I seriously doubt that Khan would even agree to face one-third of those names. Could you honestly see Khan ever agreeing to fight the likes of Canelo, Cotto, Spence and Golovkin? I know I don’t see him taking on any of those names. Khan needs to realize that Mayweather isn’t going to bother fighting him not because he’s afraid of him, but because Khan never did a thing about avenging his losses to Danny Garcia, Breidis Prescott and Lamont Peterson. Mayweather said it himself recently that Khan still has Danny Garcia problems. It’s not interesting for Mayweather to fight a guy who was thrashed the way Khan was in his loss to Garcia. That’s why it’s impossible for Mayweather to agree to fight Khan because he still has unfinished business with three other fighters that whipped him. Mayweather doesn’t want to be seen competing with a guy that was already whipped badly by other fighters because there’s no real gain for Mayweather in a fight like that. If Mayweather destroys Khan, then people will likely say ‘big deal. Khan was already blown out by Danny Garcia and Breidis Prescott.’ The fans wouldn’t care and Mayweather would have wasted his time fighting Khan. I think Khan needs to spend the next two to three years of his career fighting the 11 names on my list of top fighters if he wants to become the No.1 fighter in the sport. If I were Khan, I would start at the top of the list by looking to face the likes of Cotto and Golovkin in his first two fights because those guys won’t be around too much longer. If Khan stretches this out for the next five to six years fighting all the guys on my list, Cotto and Golovkin will likely be retired and living a life of luxury with their wealth. Khan should go after them first, and then look to face the other names on the list. Mayweather already cleared out the welterweight division, as well as other divisions he’s fought at since he turned pro. Khan never even cleared out the 140lb division. He started to brag about how he was the guy at 140, when he held the IBF/WBA titles after beating old lions Andriy Kotelnik and Zab Judah to capture their world titles, but then things completely fell apart for Khan with him losing to Danny Garcia and Lamont Peterson in back to back fights at 140. Khan then faced five weak punchers in little 5’5” Carlos Molina, Julio Diaz, Luis Collazo, Devon Alexander and Chris Algieri, and all of a sudden he feels like he earned the right to face Mayweather. Khan still hasn’t faced one of the talented welterweights with punching power, and I don’t know what he was doing facing those other guys. Heck, I had Khan losing the fight to Julio Diaz too. Khan couldn’t even get through five weak opponents without losing. I’ve seen Khan’s fight against Julio Diaz three times, and I scored it for Diaz each time. The fight took place in the UK and the crowd was firmly behind Khan. 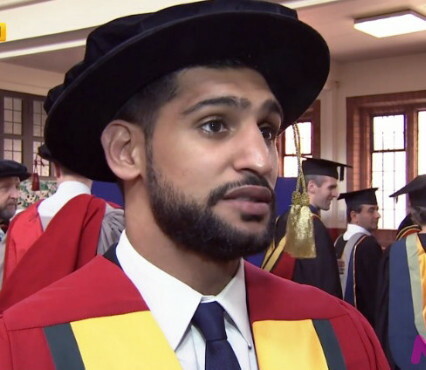 “I bring so much attention to the table more than any fighter in this time because except the only other big name is Manny Pacquiao and he’s already fought him,” Khan said. Nah, Khan doesn’t bring as much to the table as guys like Canelo and Golovkin in the United States. Those guys are clearly much more popular than Khan. If Khan’s goal is to become the No.1 fighter in boxing, then he’s going to need to be able to beat the likes of Canelo, Golovkin and Cotto, because those are the types of guys that Mayweather was fighting to become No.1. Khan can’t say he’s not big enough to fight them because he’s taller than Mayweather at 5’10”, and he started his career out at a higher weight class than Mayweather at lightweight compared to his super featherweight.